My son visited home and essentially told me that he was running out of space for his blu ray collection. I thought this would be a fun project to do with a single board from a pallet and I think that it turned out quite well. 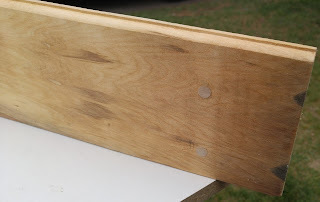 We used a single board from a Pallet and this took about 3 hours over the span of a few days as we were using glue to bring the parts together. You can see in the first picture all the way to the right the discoloration of the wood due to nails being in the wood for a very long time. 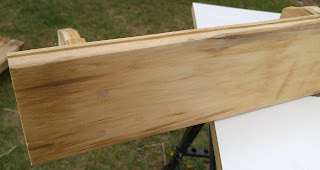 We used screws and glue to attach the brackets to the shelf permanently and covered the holes with plugs which were sanded flush. This was a no-cost project unless you count the 6 screws and the glue that was used. Good son-father bonding time was the ultimate reward!